While Virgin Media is pretty much unmatched when it comes to superfast broadband speeds, it's almost always beaten when it comes to price. Thankfully, that has changed with the arrival of Virgin Media's latest Black Friday deals. The speedy ISP has decided to get into the spirit of the blockbuster sales event by slashing the price of its VIVID 100 internet bundle. This bundle offers an average download speed of 108Mbps. For context, Netflix recommends 25Mbps to watch its Ultra HD shows and movies in the best possible quality – so there's enough bandwidth with this bundle for the whole house to be streaming 4K simultaneously. It also boasts an average upload speed of 6Mb. With this package you'll also get the benefit of a phone line and its Talk Weekends add-on with its free weekend calls to UK landlines and Virgin Mobile numbers. The VIVID 100 plan is now down to £25 a month – a saving of £2 on each bill. That brings the VIVD 100 bundle down to the lowest price Virgin Media has ever offered. In terms of upfront costs, you'll have to cough up a £25 set-up fee, but then it'll simply be a case of paying the £25 monthly cost from then on. You won't find such ridiculously fast speeds for such a low monthly price from any other widely available internet service provider. Happy Black Friday! What else is Virgin offering for Black Friday? If you were hoping to get your broadband and TV deal sorted in one fell swoop this Black Friday, Virgin Media has a deal that's sure to appeal. That's because the firm has slashed £348 off the total cost of its Full House Bundle – which combines 230+ channels including BT Sport in Ultra HD, a brand-new TV V6 box, and 108Mb fibre broadband speeds to boot. Virgin Media has discounted the plan to £45 a month. 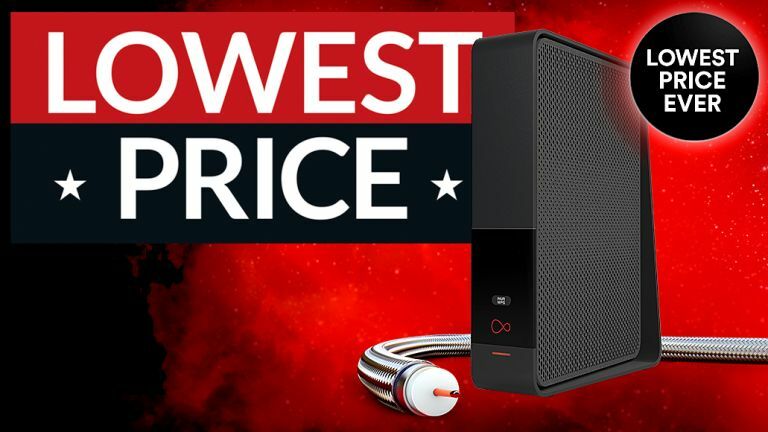 Or you can go all out with its bumper VIP Bundle – that also throws in Sky Sports HD and Sky Cinema HD, a second TV V6 box for multi-room viewing, a frankly ridiculous 362Mb download speeds, and unlimited Anytime calls – for £75 per month, down from £89.